Candiace Dillard and Chris Bassett are officially husband and wife! 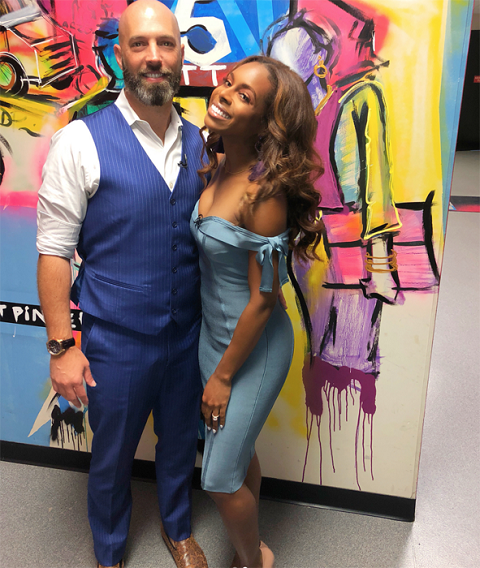 The Real Housewives of Potomac alum and her boyfriend-turned-fiancee have gotten married, Bravo has confirmed. A source told media, the RHOP, 31, star exchanged vows with restauranteur Chris on Saturday, August 11, in a lavish wedding ceremony in the Andrew W. Mellon Auditorium in Washington, D.C.
As per the report, the ceremony reportedly rang in around $200,000 and roughly 260 guests were there to attend the couple's big day. According to Bravo reports, the bride opted for a Karen Sabag gown down the aisle after viewers witnessed the actress' shopping for wedding dresses on the show. Back in June, the reality star spoke to the challenges of planning the guest list to The Daily Dish. The guest list is the most stressful part. I always knew that, for me, planning a wedding would be challenging because of my blended family and [being] raised by a dad and a stepdad and a mom who were instrumental in creating this magical person you see before you now … It’s just been difficult to figure out how best to do that and not make anyone feel like they’re not important. Candiace now has her own blended family; she has become an official stepmother to Chris’ three children from his two past relationships. Once I knew that I was in love with Chris, I just loved his kids; it was just sort of automatic. They’re an extension of him, and because they’re an extension of him, they’re an extension of me. And when, if and when, [I have] a child, I want for my biological children and my ‘bonus children’ to have a special bond and a relationship, so I feel like it just kind of worked out. The couple first met when they were working at a restaurant together. In May 2017, they eventually became engaged.